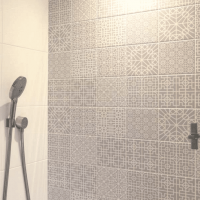 A Victorian Grey Tile – panel sample will give the appearance of a tiled wall but with the convenience of easy installation and the benefit of huge cost savings. See the product before you purchase a main order. This sample product is sold per A4 size panel. Our moulded tile splash backs (suitable for kitchens & bathrooms) are a patented, high performance, fast fit and maintenance free wall tile paneling system. This makes them the leading alternative to bathroom tiles, or kitchen splashbacks. The industrial revolution brought many great things including the ability to mass produce colour tiles. We have brought these classic designs back to the future. The vibrant colours and crisp lines of the Victorian range are truly inspirational. Designed and manufactured to be applied directly to any reasonably level wall surface including brick, block, plaster, boarding or existing tiles. Higgins Wall Decor Store caters for different tastes and creative minds. Moulded tile splash backs (also suitable for kitchens & bathrooms) are between 2 and 3 mm thick so they maximise your room space. Easy to cut and fit they can be joined like a jigsaw. reducing waste and cost. They’re also easy to clean as there is no grout for the dirt to get trapped in. All our products are 100% recyclable and have a 10 year guarantee. If used to renovate a kitchen or bathroom, your project is sure to impress. A Higgins Wall Decor Store choice will give you that look you’ve been after. Construction: Acrylic Capped, ABS Moulded plastic. Tile size: 150 x 155 mm. Half Panel (450 x 2495 mm). Thickness: 2 – 3 mm. Weight: Full Panel – (4.46 kg) – Half Panel – (2.23 kg). Coverage Area Per Panel: Full (2.25 m2). Half (1.12 m2). Cutting: Use a Stanley Knife or Fine-Toothed Saw. Fixing: Use our HG Adhesive for No Profiles and Seamless Joints. Product Density: ISO 1183 – D 792 – 1.10g/cm3. Impact Strength: ISO 179/fa – CHARPY at 23°C – 22 KJ/m2. Scratch Resistance: Acrylic Hard Coat so resistance is Very Good. Water Resistance: This product is Non Porous so is 100% Waterproof. Maximum panels per pallet: 12 (each pallet will incur a delivery fee). Typical delivery lead time for all UK deliveries is 7 – 10 days. Contact Us for multi panel orders.